Professor Green attends a photocall at The Morrison Hotel as final preparations for this evening's Arthur's Day celebrations get under way on September 27, 2012 in Dublin, Ireland. Arthur's Day taking place on September 27 celebrates the life and legacy of Arthur Guinness, the man behind the iconic pint. Arthur's Day sees fans come together to experience live music events in over 500 pub venues across Ireland. It promises to be an extraordinary night of live music featuring hundreds of home grown Irish acts, rising stars and internationally renowned artists such as Example, Tinie Tempah, Ellie Goulding, Mika, Professor Green, Fat Boy Slim, Texas, Fun Lovin' Criminals, Amy Macdonald, Primal Scream and Mumford & Sons. For more information visit www.guinness.com or the Guinness Ireland Facebook page. 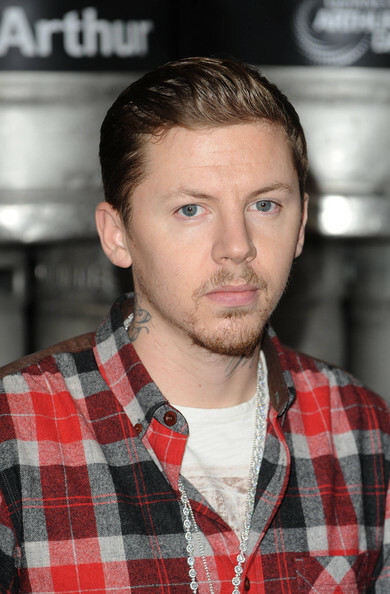 Professor Green slicked back his hair for a clean finish during an Arthur's Day celebration.